Shortly before Christmas 1606, three small ships left London’s Blackwall docks to establish a settlement on Chesapeake Bay, in North America. The largest of the ships, the heavily armed, 120-ton merchantman Susan Constant, carried seventy-one passengers and crew, including the experienced commander of the fleet, Captain Christopher Newport; a highly successful privateer during the sea war with Spain, he had made many voyages to the Caribbean in the 1590s and early years of the seventeenth century and knew as much about American waters as any Englishman alive. The Godspeed followed with fifty-two men on board, while bringing up the rear was the tiny pinnace Discovery, which carried twenty-one men crammed together wherever they could find space in between provisions and equipment. Altogether, thirty-nine mariners and 105 adventurers set out to found what would be England’s first permanent colony in America. The Jamestown expedition was not the first attempt to establish a colony on the mid-Atlantic coast. In 1585, Sir Walter Ralegh sponsored a colony on Roanoke Island, off the mainland of North Carolina, which ended the following year with the abandonment of the settlement. Another attempt made in 1587 under the leadership of John White also ended in failure and the disappearance of 117 men, women, and children (known since as the Lost Colony of Roanoke). On the eve of Jamestown’s founding, the English still had not succeeded in establishing a single colony in America. In some respects, Jamestown was a belated continuation of Ralegh’s Roanoke ventures. In the winter of 1586, a small exploratory party had been dispatched from Roanoke Island to survey the Chesapeake Bay. The men had returned with highly favorable reports of the land and deep-water rivers that would make superb harbors for ocean-going ships and privateers, which could then plunder Spanish treasure fleets on their way across the Atlantic. By the time planning began to establish a colony on the Chesapeake Bay, James I of England had already concluded a peace treaty with the Spanish and would not tolerate piracy, but he was prepared to allow the planting of English settlements in North America as long as they were located in lands uninhabited by other Europeans. 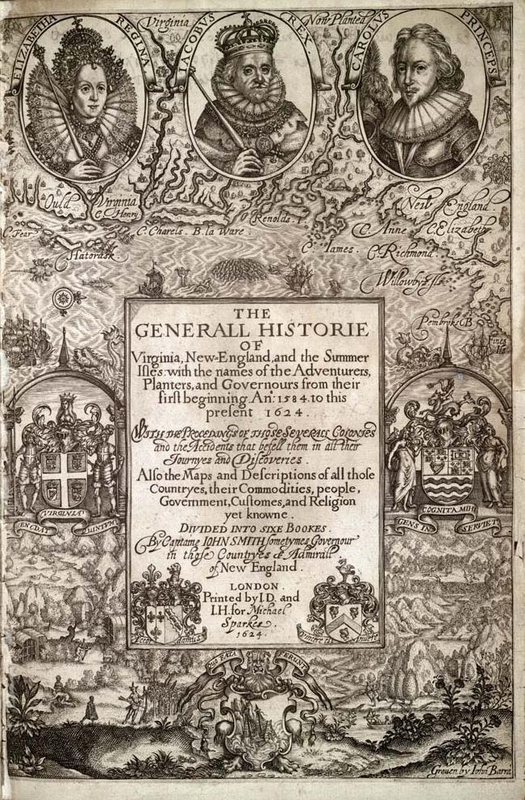 On April 10, 1606, the king granted a charter to the Virginia Company to create two colonies, one to the south between latitudes 34 degrees and 41 degrees North (from modern-day North Carolina to New York), and the other between 38 degrees; and 45 degrees (from the Chesapeake to northern Maine). The Virginia Company of London was responsible for promoting and governing the southern colony. Owing to the practical difficulty of overseeing day-to-day affairs in Virginia, the Company created a local council to rule the colony headed by an annually elected president. The aims of the Jamestown expedition were to establish England’s claim to North America, search for gold or silver mines, find a passage to the Pacific Ocean (the “Other Sea”), harvest the natural resources of the land, and trade with Indian peoples. The settlers arrived off the Virginia capes on April 26 and the ruling council chose Edward Maria Wingfield, one of the prime movers of the expedition and a veteran of wars in the Netherlands and Ireland, as the colony’s first president. After reconnoitering lands along the James River for a couple of weeks, the council selected a site on a peninsula about fifty miles from the entrance to Chesapeake Bay, where they landed on May 14. They named the settlement Jamestown in honor of their king. The English had settled in a region ruled by a powerful chief named Powhatan. Powhatan’s domains (called by the Indians Tsenacommacah) stretched from south of the James River to the Potomac River, and included more than thirty tribes numbering approximately 14,000 people. The colonists had been instructed by the Company to be cautious in their dealings with the Indians but to try to keep on good terms so as to encourage trade. Initial contacts indicated that some peoples were friendly but an attack on the English settlement by several hundred warriors at the end of May persuaded the colony’s leaders to construct a sturdy fortification. Work began on a triangular fort facing the James River, and was completed within three weeks. Early explorations confirmed the area’s natural abundance, and information passed on by Indians hinted at great wealth to be found in the piedmont and mountains to the west. Secure within the palisades of their newly constructed fort, the settlers’ prospects appeared rosy, but after Newport returned to London in June 1607, the colony suffered a number of setbacks. During the summer and fall a combination of disease, sporadic Indian attacks, polluted drinking water, and poor diet led to the deaths of about two-thirds of the men. By December, only thirty-eight of the original 104 colonists who arrived at Jamestown survived. The colony was on the brink of collapse. Reinforced by more colonists and fresh supplies early in 1608, the English continued to search for precious minerals and a river passage through the mountains that would lead them to the Pacific. Captain John Smith carried out two explorations of the Chesapeake Bay and its major rivers, revealing the extensiveness of the region, but found no evidence of mineral deposits or a passage. When he took over leadership of the colony in September 1608, he urged the colonists to give up the search for gold and silver and concentrate instead on producing goods and manufactures to return to England. Meanwhile, the London Company, now led by the powerful merchant and financier Sir Thomas Smythe, had decided to thoroughly reform the colony to attract new investors and make the venture profitable. Emphasis was given to strengthening the colony’s leadership, producing manufactured goods and commodities, continuing the effort to find precious minerals, and bringing about the conversion of the Powhatans to Christianity. The arrival of several hundred colonists during 1608 and 1609 led to a steady deterioration in relations with the Powhatans. Full-scale hostilities broke out in the fall of 1609 and in the winter the Powhatans sealed off Jamestown Island in an effort to starve the colony into submission. During the siege, later called by colonists “the starving time,” the colony’s numbers dropped from about 280 to ninety. Only the arrival of Sir Thomas Gates followed by Lord Delaware, along with hundreds of new settlers, in the spring of 1610 saved the settlement from abandonment. Gates, Delaware, and another influential leader of this period, Sir Thomas Dale, all men with extensive military experience, introduced a severe code of martial law to maintain order among the colonists and prosecute the war. The “Lawes Divine, Morall and Martiall,” as they were later known, set out the duties and obligations of settlers as well as penalties for transgressions. Officers were required to ensure all those under their command attended divine service twice daily and to punish anyone who blasphemed “Gods holy name” or challenged the authority of any preacher or minister. Serious crimes such as murder, treasonous acts and speeches, theft, trading with the Indians without permission, and embezzlement of Company goods were all punishable by death, while lesser offences such as slandering the Virginia Company or the colony’s leaders carried the penalty of whippings and galley service (serving at the oars of longboats). War dragged on for four years before ending inconclusively in 1614. 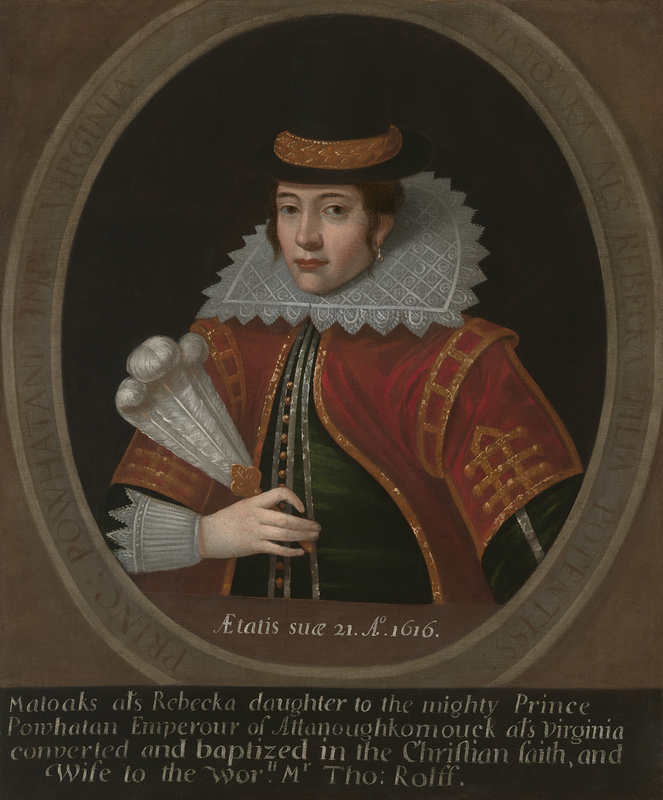 The marriage of Pocahontas, one of Powhatan’s favorite daughters, to John Rolfe, a prominent gentleman, was interpreted by the English as a diplomatic alliance and heralded an uneasy truce between the two peoples. Rolfe had been experimenting with the cultivation of tobacco for a couple of years and introduced a new type of leaf from the West Indies that was sweeter than the native Virginia plant and more palatable to English tastes. Settlers enjoyed a rapidly expanding market for tobacco in England leading to the rapid expansion of English settlement along the James River Valley. The Company proceeded with the establishment of a range of industries including glass blowing, iron smelting, and manufacture of potash, soap ashes, pitch, and tar. Settlers also produced a variety of timber goods, as well as attempting unsuccessfully to cultivate grapes for wine-making and mulberry trees for silk production. In 1618, the Company introduced sweeping reforms designed to replace martial law with laws more like those of England. Land reforms permitted the acquisition of private property (previously all land and profits belonged to the Company). 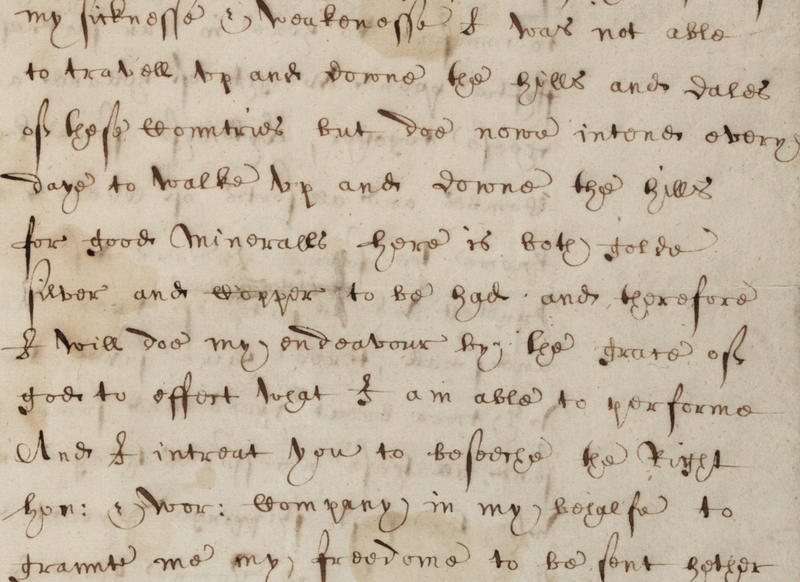 The following year the first representative legislative assembly in America, convened in Jamestown’s church at the end of July 1619, underlined that colonists would have some say in running their own affairs. Just a few weeks later, in August of 1619, The White Lion, a privateer carrying about two dozen Africans, sailed up the James River. The Africans had been captured by Portuguese colonists in Angola and put on board a slave ship, the St. John the Baptist, bound for Vera Cruz in Spanish America. The White Lion had attacked the ship in the Gulf of Mexico and plundered her cargo. 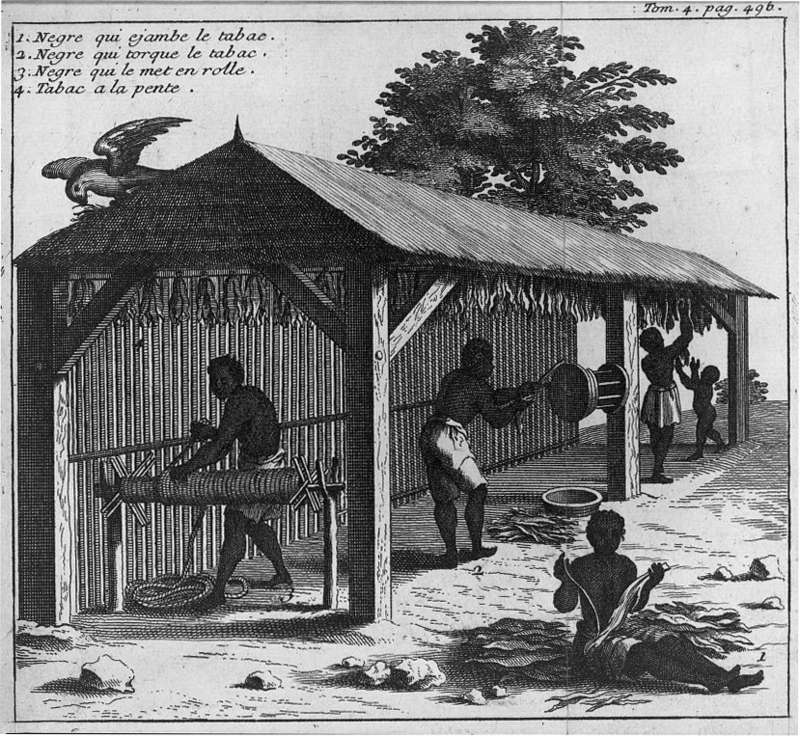 In Jamestown, the Africans were exchanged for provisions. Their status as slaves or indentured servants is uncertain but their arrival was an early forerunner of the tens of thousands of enslaved Africans who would follow over the next century and a half, and who would be the main source of labor in Virginia’s tobacco fields. By the early 1620s the colony was booming. The white population, which had never been more than a few hundred in the early years, had risen to well over a thousand. As tobacco exports increased, profits multiplied and planters sought more laborers. 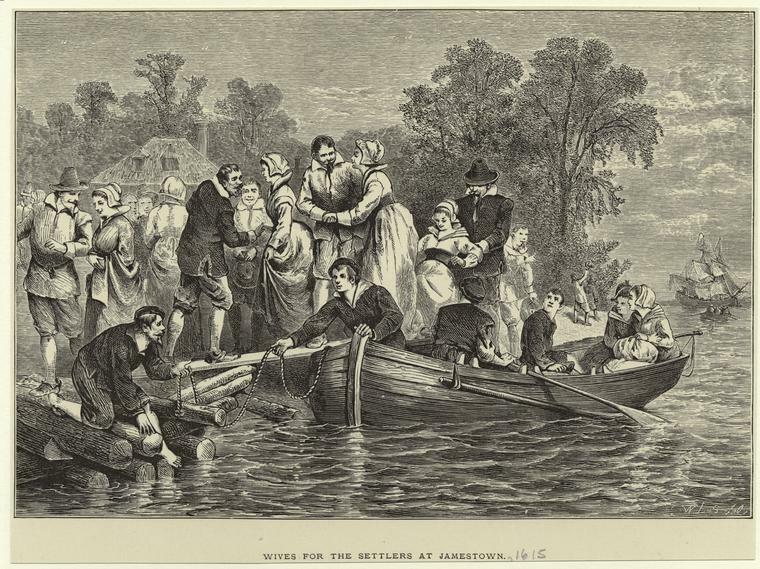 The first mass migration to English America occurred between 1618 and early 1622 when at least 3,000 settlers arrived. Yet the spread of English settlement and taking of Indians’ lands brought misery and bitterness to local peoples. 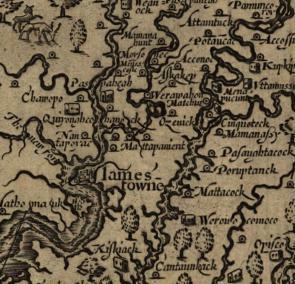 Led by Opechancanough (who had succeeded his elder brother, Powhatan, as de facto paramount chief on the latter’s death in 1618), Indian warriors attacked settlements all along the James River on March 22, 1622, killing about 350 settlers—one-quarter of the colony’s white population. The uprising and further losses of life and property over the next year were devastating blows to the Company, which, after a government investigation, collapsed in 1624. Following the demise of the Company, the crown took control of Virginia, which became England’s first royal colony in America. The war with the Powhatans lingered on for the rest of the decade, but colonists quickly rebuilt plantations in response to the continuing demand for tobacco. The success of tobacco cultivation and defeat of the Powhatans secured the colony’s future after 1625. At Jamestown the English learned the hard lessons of sustaining a colony. All successful English colonies followed in its wake, but Jamestown also presents two sides of America’s founding. On the one hand, England’s New World offered many settlers opportunities for social and economic advancement unthinkable at home; while on the other, colonization unleashed powerful destructive forces that were catastrophic for Indian peoples, whose lands were taken by colonists, and for enslaved Africans and their posterity, whose labor enabled Jamestown, and indeed America, to flourish. James Horn is Colonial Williamsburg’s vice president of research and historical interpretation. He is the author of numerous books and articles on colonial America, including A Land as God Made It: Jamestown and the Birth of America (2005).